I am excited to share with you today a guest post from one of the sweetest people I know. Kay from Cooking with K and I met a couple months ago and immediately formed a wonderful friendship. Please give her a big welcome. Hi! I am Kay from over at CookingwithK.net. I live in East Texas with Southern roots. I love sharing recipes that have been passed down through the years. I am so happy to be guest posting for Melissa today. I wish we lived next door to each other so we can share our recipes with a morning cup of coffee like we did at the Southern Food Bloggers Retreat. 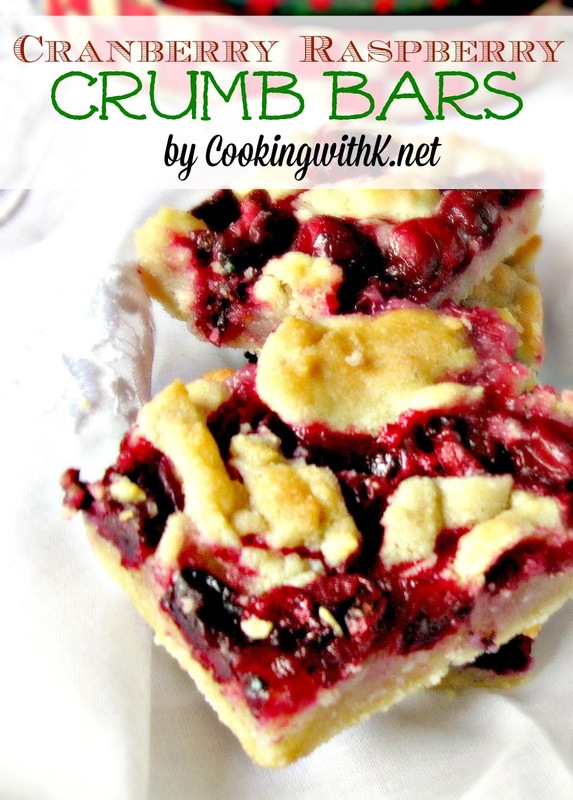 Today, I am sharing Cranberry Raspberry Crumb Bars. I love the combination of tartness in the cranberries and sweetness in the raspberries all baked together in a buttery crust. These Cranberry Raspberry Crumb Bars are super easy to make, and when cut into mini squares, they are just right for a cookie tray. The next time you need a delicious treat for a special occasion, remember these Cranberry Raspberry Crumb Bars. Enjoy! Preheat oven 350 degrees F. Butter a 9 x 13 inch baking dish; set aside. In the bowl of a food processor, add flour, granulated sugar, and baking powder. Pulse a couple of times to mix together. Add butter and pulse until mixture is pea size. In a small bowl, slightly beat eggs and milk. Add to flour mixture while pulsing. Pulse only until dough slightly starts to come together. Do not over mix. In the prepared dish, pat two-thirds of the dough in the bottom and all the way to sides. In bowl, toss cranberries and raspberries with vanilla. Distribute cranberries and raspberries on top of the bottom crust. Using the 1/3 remainder dough, pinch small size crumbs and distribute across the blackberries. Sprinkle with coarse sugar over crumb topping. Bake for 45-50 minutes until bubbly and golden brown. Remove and place on a cooling rack until completely cool to the touch. Slice into bars. Thank you so much Kay for sharing with us today. I imagine these would be wonderful with any berry. These would surely go great with a cup of coffee. If you haven't visited Cooking with K please do so. She shares many wonderful recipes. I know the next time we meet Kay, it will be as if no time had passed at all. Sending love and hugs all the way to East Texas! Thanks Joy, I can't wait to make these! Looks fantastic. So colourful, feel like having a bite. Looks very delicious! I'm going to make these bars in the weekend. These bars look amazing! 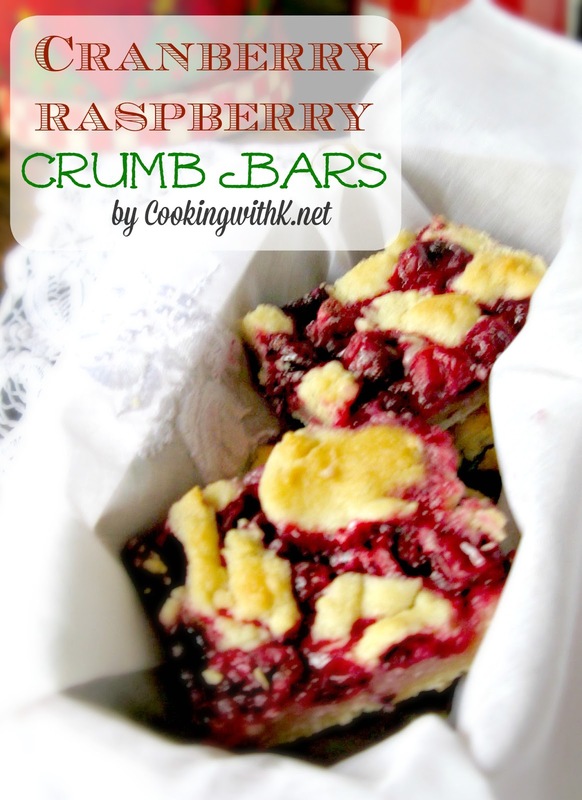 Such a great idea to combine cranberries and raspberries!